2560 IBM Bladecenter JS21 blade computing nodes. 63 Teraflops. 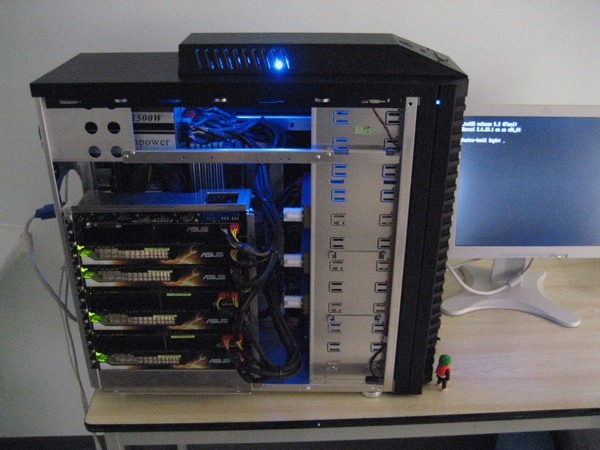 SGI's Octane III has 10 blades, each 2 x 4-core Intel 5500 series CPU’s, total 80 cores per on small rack. Pretty neat supercomputer. All Blades are interconnected by Gigabit Ethernet or InfiniBand. Supercomputer supports Red Hat or Suse, SGI Isle cluster manager and Altair PBS patch scheduler. The researchers at the University of Antwerp's Vision Lab caused quite a stir last year when they built a supercomputer with four high-end NVIDIA graphics cards, but it looks like they've truly stepped up their game for their followup: a supercomputer that packs no less than thirteen GPUs. That, as you might have guessed, presented a few new challenges, but after wrangling some flexible PCI cables into a specially-made case and loading up a custom BIOS courtesy of ASUS, they were apparently able to get six dual-GPU NVIDIA GTX295 cards and one single-GPU GTX275 card up and running with only a few hiccups. As before, the big advantage with this approach is that you get an enormous amount of computing power for a relatively small cost – twelve teraflops for less than €6,000, to be specific. Head on past the break for a pair of videos showing the thing off, and hit up the link below for the complete details (including some jaw dropping benchmarks). Boston's drool worthy Venom T4000 GPU personal super computer (PSC) is a highly optimised platform that has been designed to provide massive amounts of parallel computational processing power. Taking advantage of the latest developments in GPU computing from nVIDIA the venom arrives with 4x nVIDIA Tesla C1060 GPU compute controllers and provides full support for over a staggering 960+ GPU compute cores and 4 TFLOPS of computational power. In addition full Heterogeneous computing is supporting by combining the latest nVIDIA GPU's with Intel's latest Nehalem architecture based Tylersburg Xeon processors. Europes fastest super computer at the Gauss Centre for Supercomputing in Jülich. It consists of 295,000 processors housed in 72 phone booth-sized cabinets, equals the power of more than 50,000 PCs.